Rectrix MRO is a FAA Part 145 Repair Station, utilizing only licensed Airframe and Powerplant Mechanics to expertly maintain and repair a wide range of aircraft. Rectrix MRO has been providing maintenance on most jet aircraft since 1988 and is proud to offer our fellow corporate operators maintenance services at affordable rates. Our ratings include Class 1 and Class 3 which cover light airplanes up to 12,500 pounds as well as ratings for all series of the following aircraft: Challenger 300/600, Gulfstream, Falcon 50, Hawker, Citation, Lear, Beechjet, and King Air. We are also proud to hold ratings for performing FAR 94.411 and FAR 91.413, Altimeter and Transponder checks, including RVSM checks. Rectrix MRO also offers maintenance from the simplest 50-hour and 100-hour inspections to phase and area docket inspections, from area painting to sheet metal repairs, gear overhauls, and pitot static testing. Our goal is to become your first choice for aircraft maintenance and provide the finest quality of products and services available. From picking up your aircraft and performing quality maintenance to detailing it prior to delivery, our mission remains simply stated: To offer the best service in a safe and efficient manner. The Federal Aviation Administration has awarded Rectrix MRO the valued title of FAA Authorized Repair Station (#QFYR349K & #QFYD349K). 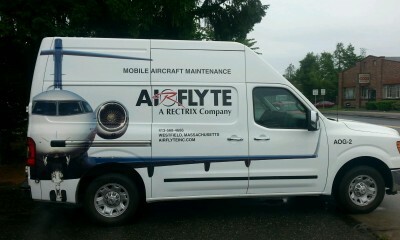 Rectrix MRO by AirFlyte’s Mobile Aircraft Maintenance Van allows our technicians to perform maintenance on aircraft throughout the Northeast and most of Florida. Experienced FAA-licensed maintenance technicians are highly-trained and dedicated to ensuring your aircraft is safe every time you fly. Our FAA-approved repair stations are audited regularly for accuracy and continually upgraded to maintain the highest level of quality assurance for our customers. Rectrix MRO has been providing corporate aircraft maintenance since 1988 and is recognized as a leader in the industry. We strive to become your first choice for aircraft maintenance and provide the finest quality of products and services available. Our team loves the aircraft maintenance business – and it shows.